This place is quite the opposite of the last restaurant I reviewed. I had a vegetarian friend visiting from overseas recently, so we all thought it might be nice to go out to an all-vego place. We happened to be in the vicinity of Victoria st so we stopped in at this Asian-influenced vegan eatery and ordered a number of dishes to share. 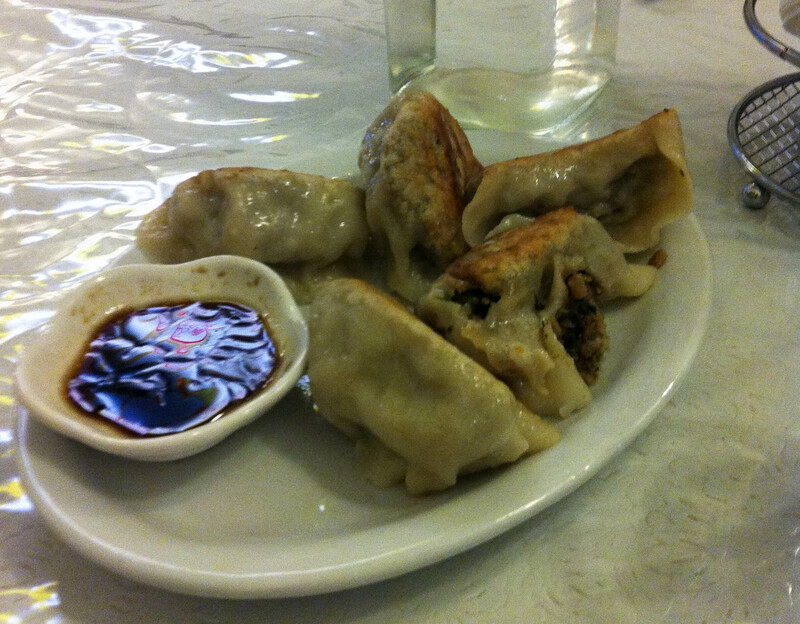 The dumplings were absolutely wonderful. They were very mushroomy, in other words very much to my taste. Some of the others at the table didn’t think much of them though so I’m letting you know now that they are basically mushroom dumplings, not just mixed vegetable dumplings. Mushroom haters: avoid! 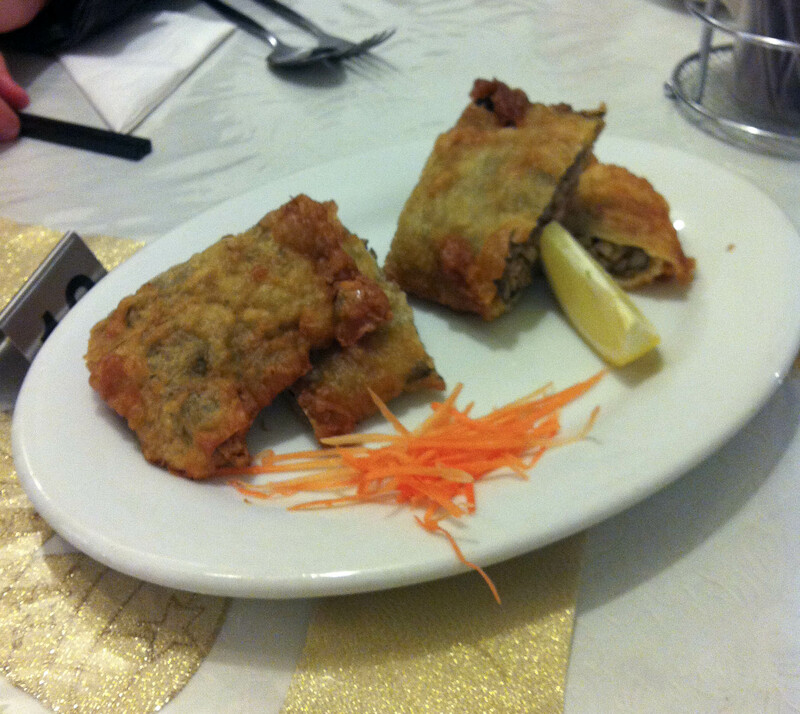 These were little deep-fried parcels of taro and enoki mushrooms wrapped in bean curd skin and seaweed. Great in theory, not so good in practice. These were incredibly oily. They just kind of oozed oil everywhere which left an unpleasant feeling in the mouth. The filling wasn’t amazing either, which didn’t help its case. Perhaps they should have called it ‘greasy delight’? And scrap the ‘delight’ part. 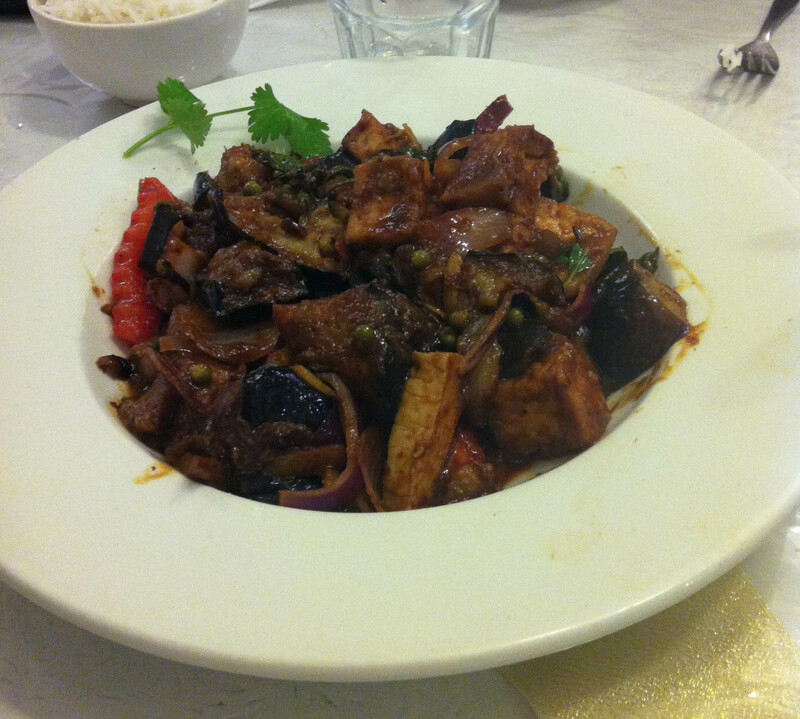 This Thai dish consisted of eggplant, tofu and mock meat in a basil sauce. The eggplant was nice and tender and the sauce wasn’t bad but it was kind of a ‘meh’ dish. The mock meat was strange: no offence, but you can kind of tell that the people who make this stuff haven’t eaten meat for a long time. It was sort of chewy and rubbery and not particularly pleasant. I much preferred the tofu. It’s hard for me to judge this one because I really don’t like char kwey teow. I’m not a fan of the really wide flat noodles that are sort of rubbery. The flavour of this was reasonable though, and everyone at the table seemed to enjoy them so I’ll assume they were good. 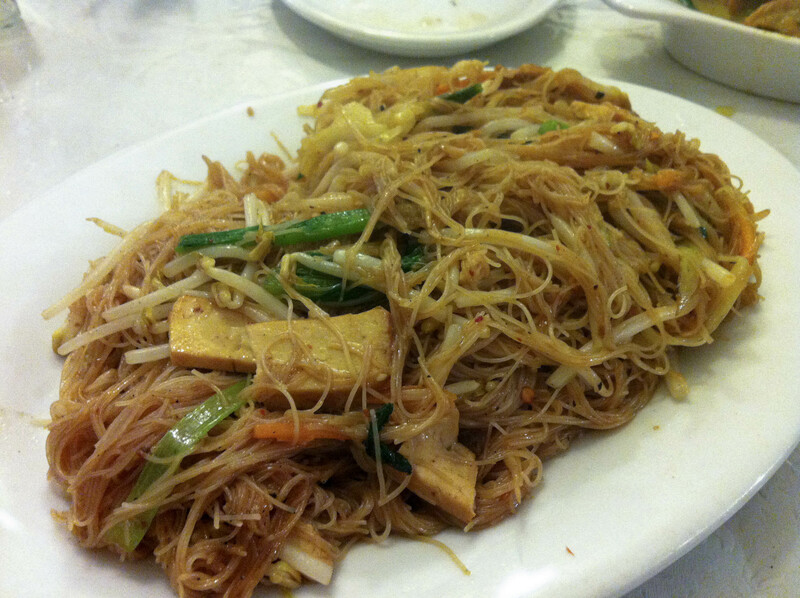 I have always been a fan of this Chinese dish of stir-fried vermicelli noodles, which is also eaten a lot in Indonesia. Loving Hut’s offering was very good: it was flavoursome and not too greasy for me. There was also a good amount of tofu and vegetables in it. This was probably my favourite dish of the night. I know a few people who love this sort of thing purely for the novelty factor. Personally I think it’s a bit tacky and I’m also not a huge fan of pineapple in things (with the exception of Hawaiian pizza). Nevertheless, I thought to myself: it’s still just fried rice. How could anyone get fried rice wrong? Well, here’s how. It was very cumin-y and turmeric-y and couldn’t really decide if it was trying to be a south east Asian-style fried rice or an Indian-style biryani. 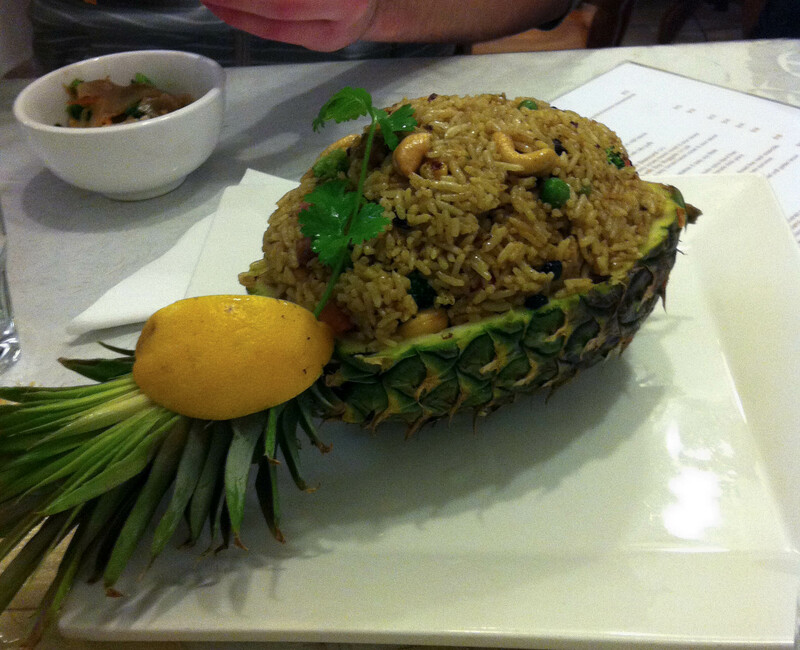 The flavour was very much at odds with what I was expecting and the little pineapple pieces just made it worse. There was something strange about this red curry. It kind of had an overpowering sweetness to it that just felt really off. I think I’ve made better red curries with jars of curry paste. The vegetables in it also didn’t seem right. I could see that they had tried really hard to go with the ‘red’ theme (ditto with the green curry: see below) which was a little lame. The mix of carrot and pumpkin (sweet, starchy veggies) in a sauce that was already sweet just didn’t quite work and it didn’t feel particularly Thai either. The green curry was actually much better than the red. The balance of flavour was right and it was nice and spicy. The green veggies in this dish were also much more appropriate (beans and broccoli). I did however find the fake prawns slightly disturbing. They sort of tasted like those ‘crab’ sticks that you get in California roll sushi which probably don’t even have real crab in them. I don’t know why I found these more disturbing than crab sticks, but I just do. Go away, creepy fake prawns! Now don’t get me wrong, I am quite open minded and respectful about an individual’s choice to avoid meat or animal products completely (having dabbled in vegetarianism myself). One thing that made me feel uncomfortable though was finding out that Loving Hut is associated with some sort of vegan cult, which follows the teachings of Supreme Master Ching Hai. This Supreme Master has apparently “received the divine transmission of the inner Light and Sound”. Hmm. (Google it, if you don’t believe me). Overall the food wasn’t bad and my vego friend certainly was taken with the fact that he could order anything on the menu. In a place like Melbourne though there are quite a few places to eat that are exclusively vegetarian and do much better food (without the creepy cult part, too). Moroccan Soup Bar, Vegie Bar and Trippy Taco immediately spring to mind. If you particularly wanted Asian food, most Chinese/Malay/Thai restaurants have a decent selection of vego dishes which are probably more authentic than what you’d get here. Perhaps it’s only worth going to Loving Hut just to say you’ve done it. 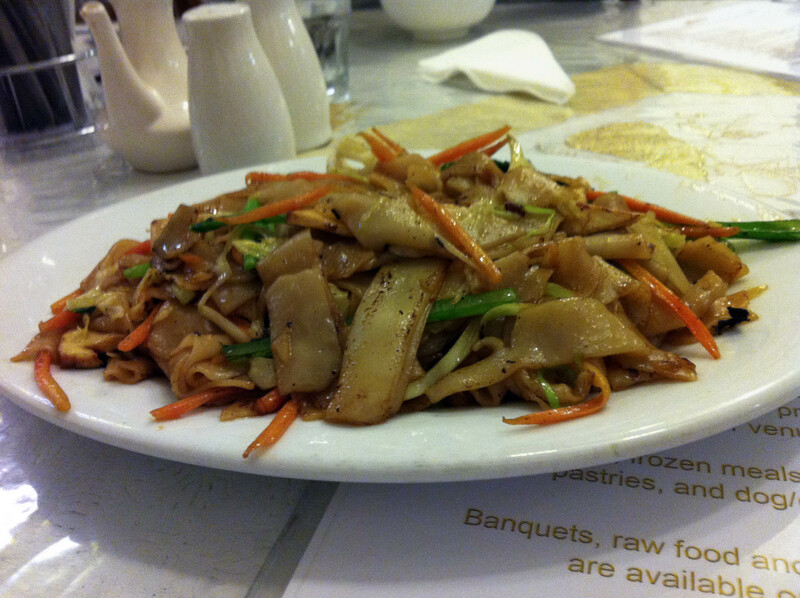 I think there are good dishes and not-so-good dishes at Loving Hut! I wasn’t very impressed on my first visit, but the second time round I ordered the salt and pepper tofu and the rendang and liked them a lot. I agree, their dishes are a bit hit and miss! I suppose you just have to know what to order. 1. Wonder if this is the same people who own a ‘Loving Hut’ in Brisbane? 2. Re your pineapple dislike. There’s the most ingenious recipe from the 70s on my blog. I;m not going to give the blog url because I hate people who go to other’s blogs to advertise their own, but it’s called the foodiste and the relevant topic is ‘get that tropical holiday feeling’. It’s a wonderful recipe that I think speak volumes of our time. There are Loving Hut restaurants all over the world, so they are probably the same people? Check it out and see if they have any hint of cultism; if so they are definitely the same people.